After another drubbing in the new home that was supposed to take this underachieving club to unimaginable heights, and after another night when the initial mutiny in the stands had given way to resignation long before the final whistle, Slaven Bilic can have no complaints if it turns out West Ham�s patience has finally snapped. It was another shambles on live television, the 10th time that West Ham have conceded at least three goals at home since last season�s move to the London Stadium and another game when the best way to beat the rush outside was to stay in your seat until the bitter end. Bilic wore a grim, haunted look as his team suffered the latest in a long line of humiliations. 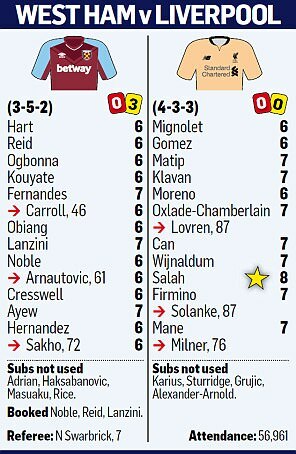 The sole positive for West Ham�s manager was that Liverpool were not more ruthless, which is a funny thing to say after a 4-1 win that moved J�rgen Klopp�s side into sixth place, below Arsenal and Chelsea on goal difference. Inspired by Sadio Man� , who created both of Mohamed Salah�s goals, Liverpool strolled to a third consecutive victory, while West Ham provided further evidence they are destined for a long scrap against relegation. They are crying out for extensive reconstructive surgery and the international fortnight offers David Sullivan and David Gold, the club�s owners, a chance to act. And what more do they need to see before putting Bilic out of his misery? It had been a fortnight since West Ham�s last home game, that chaotic 3-0 defeat to Brighton, and a week since the second-half capitulation in the 2-2 draw with Crystal Palace, and this was a mess against opponents who also have a habit of making life needlessly difficult for themselves. Liverpool fell apart on their last visit to London, losing to Tottenham Hotspur in a manner that raised further questions about Klopp�s approach, and they needed time to adjust to a new system that saw Alex Oxlade-Chamberlain on the right and Salah operating in the hole behind Roberto Firmino, with Man� a constant roving menace on his surprise inclusion after a month out with an injured hamstring. It did not help that Jordan Henderson was missing with a muscle problem but the impact of the midfielder�s absence was minimised by Gini Wijnaldum�s late recovery from an ankle injury. There was an early sense that West Ham�s forwards fancied their chances against Ragnar Klavan and Jo�l Matip. The hosts almost took an early lead when Manuel Lanzini�s deflected pass ran kindly for Andre Ayew, only for the forward�s post to hit the woodwork. West Ham would rue Ayew�s miss. �We started well,� Bilic said. �We were not allowing them space in behind.� But then came the three-minute spell when the game spiralled out of West Ham�s control midway through the first half, a collapse sparked by a soft opening goal. It beggared belief that Aaron Cresswell found himself confronted by three Liverpool attackers after a West Ham corner was cleared. 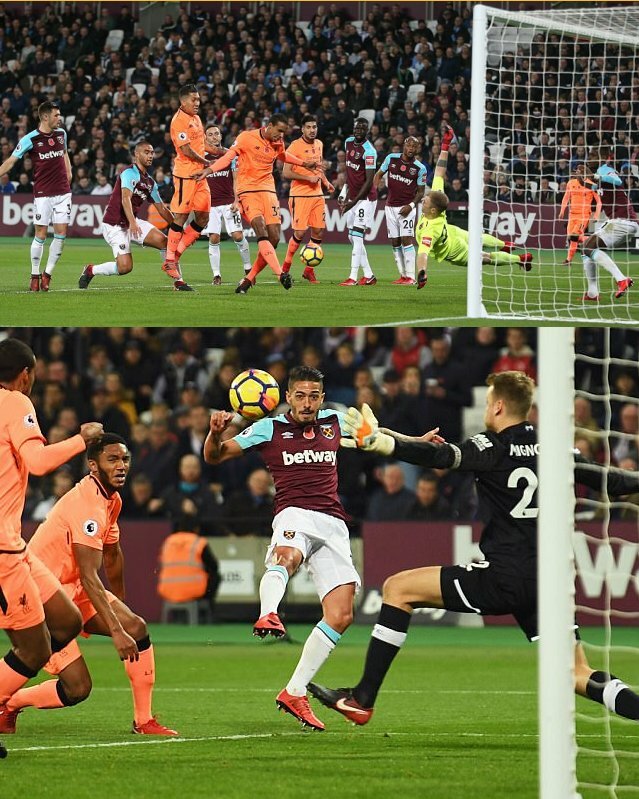 Bilic insisted his team were set up well but it did not take much for Man� to burst through the middle and feed the ball to Salah, who slipped a low finish past Joe Hart and into the net. �We are conceding too many goals in that manner,� Bilic said. The loss of shape was bewildering � Bilic spoke about naivety � and so was the defending that allowed Matip to double Liverpool�s lead. Salah�s low corner hit Mark Noble and although Hart showed sharp reflexes, Matip turned in the rebound. Liverpool were not at their most fluent in the first half but they hardly needed to be. Yes, West Ham had selection issues in defence, with Sam Byram, James Collins and Jos� Fonte injured and Pablo Zabaleta suspended, while the absence of the hamstrung Michail Antonio deprived them of attacking dynamism. Their problem, however, is a recurring inability to perform the basics and they were incapable of containing Liverpool, even after Lanzini had hauled them back into the contest early in the second half. Bilic�s response at the break was to introduce Andy Carroll in place of Edimilson Fernandes, who struggled at right wing-back, and switch from 3-4-1-2 to a gung-ho 4-2-4. Carroll�s height unnerved Liverpool and an increasingly direct approach paid off when Ayew�s deep cross reached Lanzini, who steered his shot past Mignolet. Liverpool�s response was immediate, Firmino releasing Oxlade-Chamberlain, who beat Hart at the second attempt. It was a lovely moment for the winger after his exclusion from the England squad. Klopp had said Man� was ready to play for 20 minutes. After watching him in training, however, he threw the forward in from the start. Philippe Coutinho was out but Man� was superb � �a little machine,� Klopp said � and he made another for Salah near the end after a weaving run. The Egyptian�s driven, low finish emphatically sealed Liverpool�s superiority.